I'm enjoying my free day's off.. how are all your day's?? I emptyed my mailbox, my blogloving, cleaned out the attic, working in the garden, cleaned the house and moreeeeeeeeeeeeeee.. 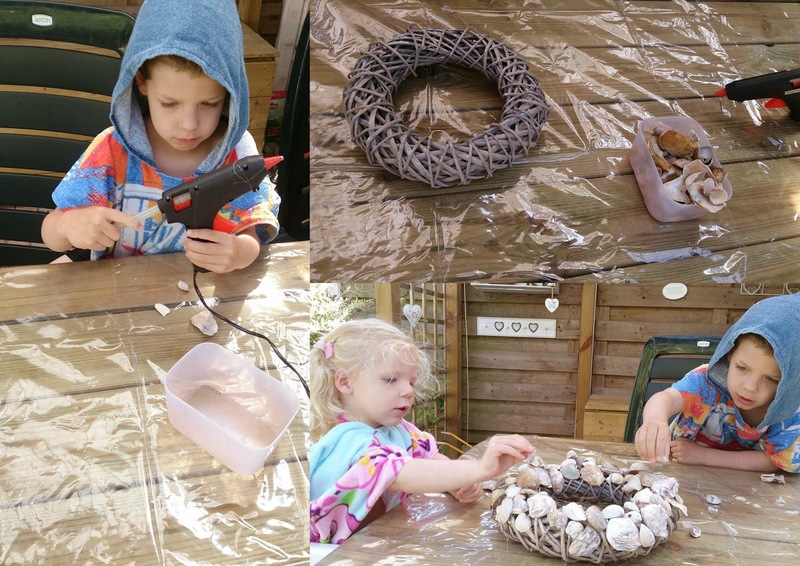 I did a lot, but not my normal crafting..
As always the kids helped me, and had a great time. The glue is hot, so that part I did, and after many shells kept falling off, I took over, they got tired of it. It's hanging next to my front-door. So proud of my kids. 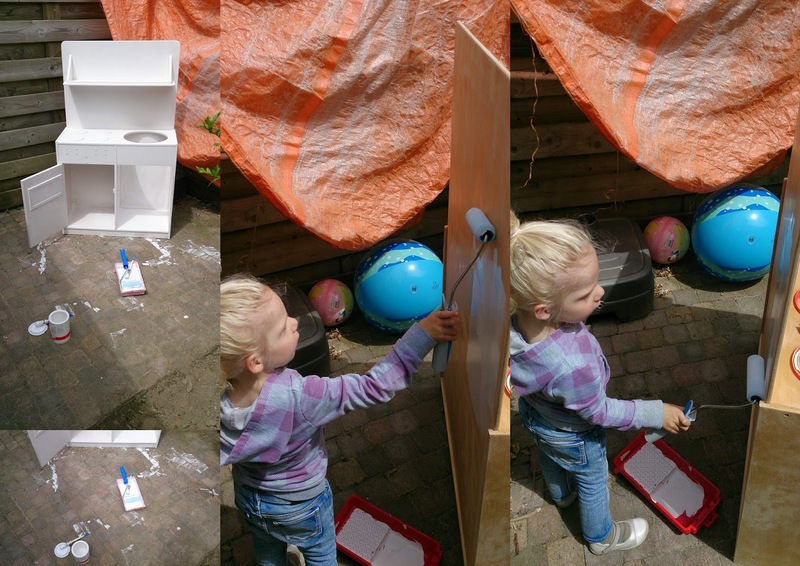 From the moment Noah and Kira where little, I wanted to make a play kitchen. I saw the most awesome DIY playkitchens. a old kitchen on school ( which I liked for weeks ), had a big paper on it, only this week free to take home!! A real big one.. but I thought with a little paint it most be more beautifuller. So I scrub it ,scrape it. And this was how it looked!! So today we started painting!! she loved it.. but the floor was also interresest to paint. and the the kitchen again. So can you imagine how the paint looks like??? Next week I will schrub it a little again, and new paint will be on it!! I think I need to paint it ones or twice.. But that's all for next week. I;m very happy with this project. The very, very first time I do something like this..
Then tonight I started with needle and thread.. I'm making a party dress for kira.. Tomorrow night I hope I have one, then I can finish it off. Next week I will show it..
What fun you are having this last week , love the shell wreath and the little kitchen , you have many talents sweet friend hugs June. Wat een leuk keukentje! Ben benieuwd naar Kira's jurk... En wat een mooie krans zeg! Je bent weer lekker crea! Groot gelijk, meenemen die keuken!! De krans is ook leuk geworden! You and your kids have made a lovely wreath! Unusual and beautiful. Your kids are going to be so artistic when they grow up! The kitchen furniture looks so much better in white and will look great when it's finished. I bet you will have a play on it too! Lekker met de kindjes bezig geweest en dat is nou genieten. Er komen weer mooie dingen uit je handen. I love your wreath and so nice that you're kids helped! You sure busy as always...love the wreath! Cute Noah posing with his 'oranje tenue'!! Good luck for the championship!!! As i had already told you, love the kitchen!! And i bet Kira loved to help it too! !